As the curator and manager for Tandanya National Aboriginal Cultural Institute, Troy-Anthony Baylis takes us through some of the ins and outs of observing, discussing and engaging with Indigenous art. Tell us a bit about your background and what brought you to Tandanya. Like many Aboriginal and non-Aboriginal Australians I am of mixed cultural heritage. I am of Irish and Aboriginal heritage: a descendant of the Jawoyn people from the NT. I have been an active participant at Tandanya for the past 13 years as a visual artist, event producer, performer, curator, and Board member, of which I was a previously Chairperson. These days as an employee of Tandanya I am responsible primarily for its programming of visual culture, managing its art collection, and contributing towards its strategic vision. I no longer exhibit my work here or am involved in the organisation’s governance. I have tertiary degrees in Visual Arts, Education, and Arts Management and I am also completing a PhD which focuses on sexual and gender diversity and Aboriginal art. As the curator at Tandanya, how do you engage with local, national and international Indigenous artists? Tandanya is funded through State and Federal government agencies to support the development of Aboriginal and Torres Strait Islander arts and culture. I try and balance the exhibition program within a relatively small budget to include local Aboriginal and/or Torres Strait Islander artists at all levels of their career and also include best practice from all over Australia. I sometimes am able to curate ideas-based exhibitions where I engage Indigenous artists from all over the world to collaborate with Indigenous artists from Australia or for their work to sit alongside, dialogue, or create critical debate. What are some common misconceptions about Indigenous art and how do you address them? Much of Tandanya’s audiences are visitors from overseas who want to engage in the uniqueness of Aboriginal culture, plus our audiences come from local and interstate, and of all age groups including school children and scholars of all ages. Aboriginal art is often misconceived as being exclusively dot-art or as either traditional or contemporary. It’s breaking down these crude barriers of understanding that is exciting and challenging, as well as breaking down misconceptions around geography, social issues, authenticity etc. I try and combat these issues by showing multiple perspectives of Aboriginality at the same time. This is achievable because depending on how I configure the gallery it is possible to present multiple exhibitions all at once. Tandanya has a bustling yearly program. What do you look for in curating each exhibition, and are there consistent themes/materials/artists the gallery may incorporate in a program? Tandanya is a large and flexible space and so I generally program three to six projects at the same time. Most exhibitions come about through national networks that include relationships with individual artists, Aboriginal arts centres, other Aboriginal curators, galleries and collecting institutions. Every so often I have the opportunity to curate a project that builds upon an idea, which I always approach like a research project – letting the work speak like chapters of a larger story. This is enhanced by producing a publication to accompany major exhibitions and by commissioning other Aboriginal thinkers to write about artists’ work, building an asset for artists to promote their work beyond the life of exhibitions. You’ve been a key part of the art training and onboarding for our staff at The Watson. What does a process like this entail, and what challenges do you face in discussing Indigenous art with a new audience? I think it is important to be aware of what else is happening and to keep an up-to-date sound knowledge of Aboriginal art in general. I think some patrons of The Watson choose to stay to immerse themselves in Tommy’s art and would appreciate being plugged into other events and exhibitions of Aboriginal culture happening in Adelaide. 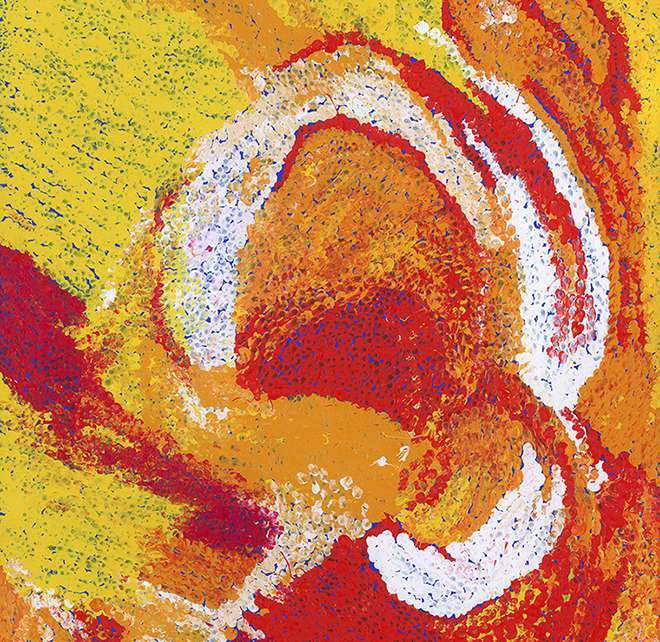 Aboriginal art can sometimes be seen as highly abstract but people are genuinely interested in trying to understand the work of Aboriginal artists. With this is mind, depending on the artist’s work; I try to find a way into the work for audiences. This may be about discussing the cultural context of the artist, about history, about colonisation, about the formal qualities of their work, the materials, subject matter, or all of these things. What do you find most affecting in Tommy Watson’s works? Tommy’s works are vibrant, bold, and colourful and I find them to be immersive, wondrous, and multivalent in meaning. I think even without an understanding of Aboriginal culture, most people with a knowledge of European and North American painting (for example Matisse, Kandinski, Rothko) will be able to appreciate the formal qualities of his paintings. The works of course are Australian, specifically by a Pitjantjatjara artist who is painting his country and drawing on cultural traditions, but also on his travels and own world-views such as astrology and place in the world. In his own way I think Tommy Watson disrupts the notion that Aboriginal people only create representations of their country by continuing to live on it; Aboriginal people of all generations, can draw upon all of their knowledge and experiences to create their own narratives, making their own mark, their own visual language. Visit Tandanya when you sleepover at The Watson. Close to our abode, it's an easy ride or a quick trip in our Smart Cars. Global name in millinery Piers Atkinson is the second maker involved in our collaboration with Melbourne Racing Club. Atkinson has captured the ferocity and boldness of Adam Cullen's works in his bespoke creations, now on display at The Cullen. Tom Ford's classic designs and understated style have dominated the fashion industry for years. He mirrors a similar neo-noir aesthetic within his films, highlighted most recently in Nocturnal Animals, cementing himself as a figure to watch in the world of cinema.